This morning 21 children from KS2 met with Mrs Roberts to take part in a session for those children deemed to be gifted and talented in French. Mrs Roberts decided to teach the group some German and the children really enjoyed the activities. 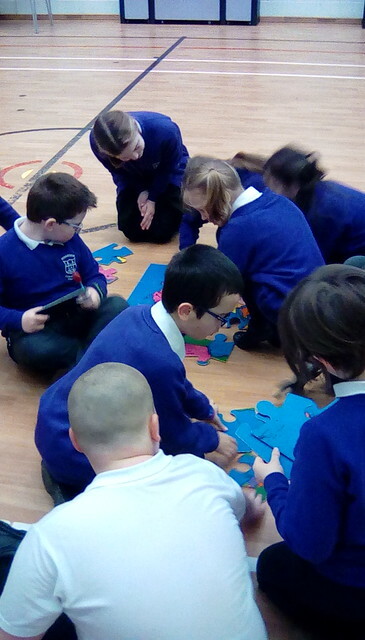 We started off by working as a group to complete a floor jigsaw that showed a map of the world and then finding Germany on the map. Mrs Roberts taught the children basic greetings, colours, numbers to 10, how to ask/give their name and days of the week in German using flashcards, games, activity booklets (which the children can take home with them) and Linguascope. Much fun was had by all and hopefully the children involved will be inspired to keep up their great work in languages.